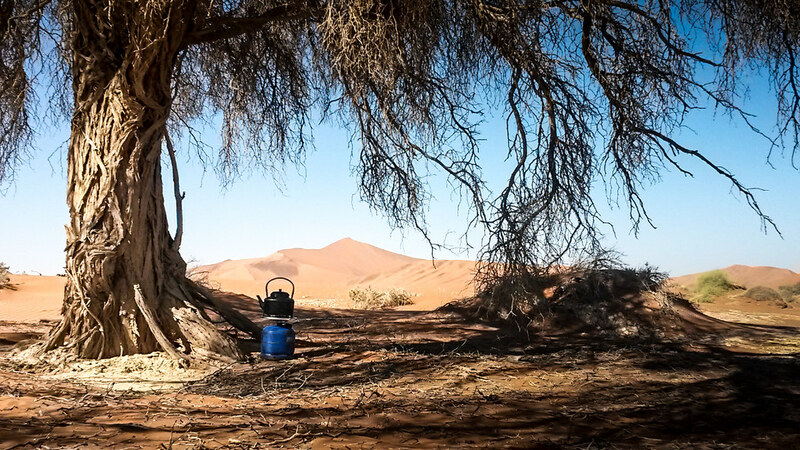 While checking into the campground at the entrance of the Sossusvlei, we found out we were unable to ride our motorcycles the 60 kilometers on asphalt to the 2-wheel drive car parking lot. They were afraid that we might decided to ride up one of those 200 meter high dunes on our motorcycles! Little did they know, that as soon as we hit that kind of sand and that slope, we would most likely come off. This rule meant that we needed to hitch a ride with someone. After our lunch we scouted the camp site, either people were coming back from the dunes or the new people already had four people in the car. It was looking pretty grim, we might not actually get to see the dunes tomorrow. Just before dusk, Mike and I went to scout the camping ground once again. Our last resort was to join an overland truck but fingers crossed someone will be able to take us. We sidled up to a young couple. I think we might have caught them in a semi romantic moment. We introduced ourselves and quickly got to the point. Romain and Ambre agreed to take us with them the following day. Over a cup of coffee, we learned that this young couple were from France and here in Namibia for a four week holiday. The conversations moved quickly, and before we knew it, we were talking about our toilet habits! It’s not often you meet someone and a second later they know all your dirty secrets. I think Mike and I just got really lucky, as we managed to chose the perfect people to hitch a ride with. The next morning, we rose from our warm sleeping bags while it was still dark. We ate Nutella on buns for breakfast in the back of the car on our way out. Slowly, signs of dawn appeared over the dunes as we got closer to our chosen dune, Big Daddy. 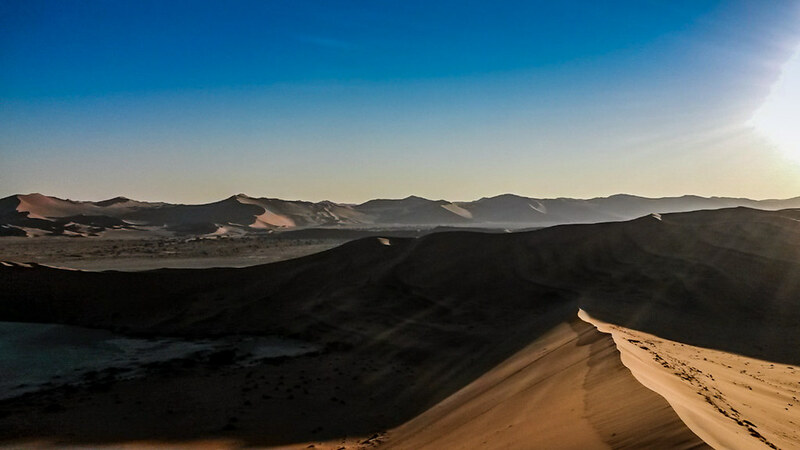 Most overland trucks and other tourists head directly to Dune 45. Dune 45 is only forty-five kilometers from Sesriem (our camping spot), it’s a dune that’s close enough to the road and only 80 meters high making it accessible to all types of people. Plus they don’t have to get up so early, to see the sunrise from the top of the dune. We were heading to Big Daddy, the largest of all dunes, standing 325 meters high. The Big Daddy Dune, is the large one behind the kettle. From where we parked the car, we could see Big Daddy in the distance. We walk quickly over the cold sand to the foot of his hill and then begin the long trudge up the spine. The sun was rising, and its warmth felt good against my skin. The soles of my feet are freezing as I walked shoeless, hoping the sun’s warmth will reach them too. We eventually got to the top and we sat down on the spine of the dune to eat an apple. 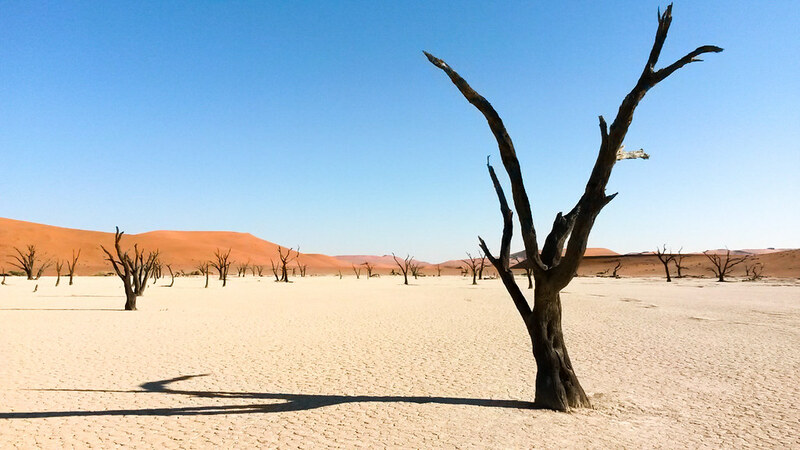 On one side of us, we see endless sand dunes and on the other, we look down into Dead Vlei. 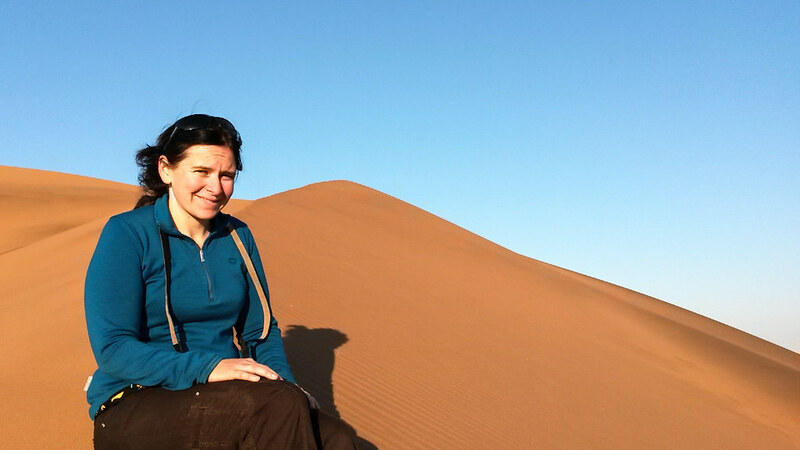 Standing at the top of a 325 meter high dune and wondering how to get down it to walk around Dead Vlei wasn’t very hard. We were going to run down the steep and sandy surface to reach the bottom. Laughing, giggling and this crazy sound the sand makes when you stride through it ecco’s of the walls of the dunes. We tried to make the 325 meter dash last as long as possible but it was just too much fun. 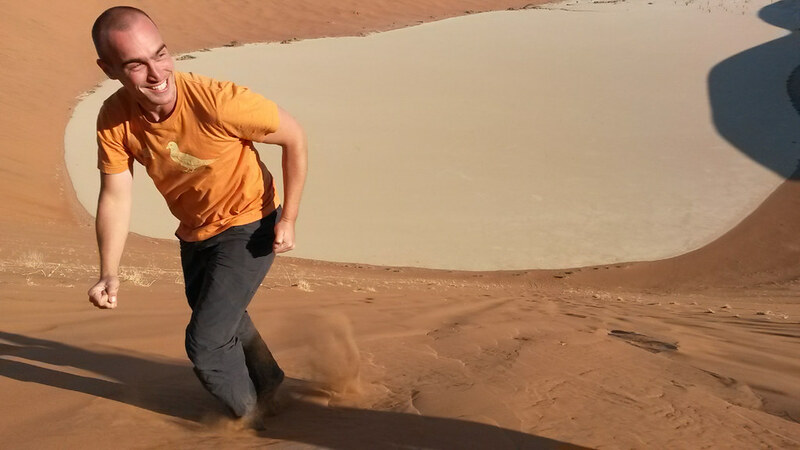 Before we knew it we were at the bottom and standing on the white clay flats of Dead Vlei. Walking amongst the petrified trees was really surreal. If only there were a few melting clocks, I would feel as if I was walking through a Salvador Dali painting. The bulk of the tourists had arrived, and the place was starting to get pretty crowded. We left this beautiful place behind for the others to enjoy. We had our moment with it and now it was time to tear ourselves away. 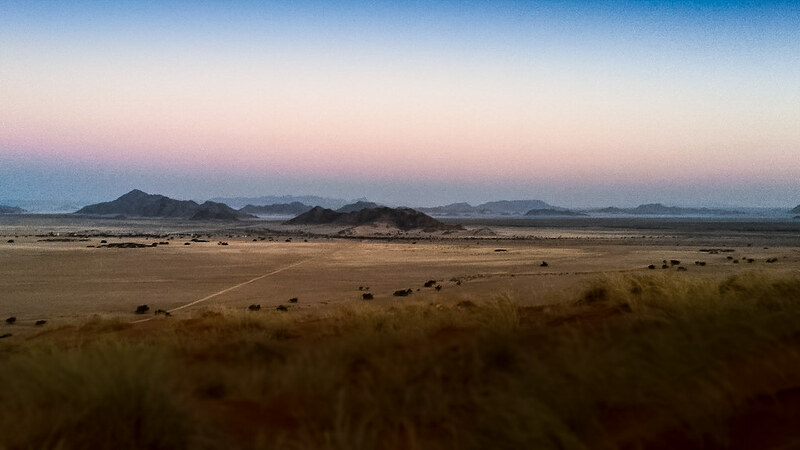 So far, this place is the most amazing place I’ve seen here in Namibia. I wonder if anything can top it. Later that night, we have dinner with our two escorts who over the day had become great friends. We thanked them for letting us hitch a ride and wished them best of luck for the rest of their trip and future plans. I’m glad we managed to meet two amazing people.Thank you so much for your generosity and humour, we had such a fantastic time, It really made our adventure more complete. Just for fun here is a video of us running down the big daddy dune. That looked like so much fun! I think I would have fallen flat on my face or sat on my bum and slid down. Where is a tray when you most need it? 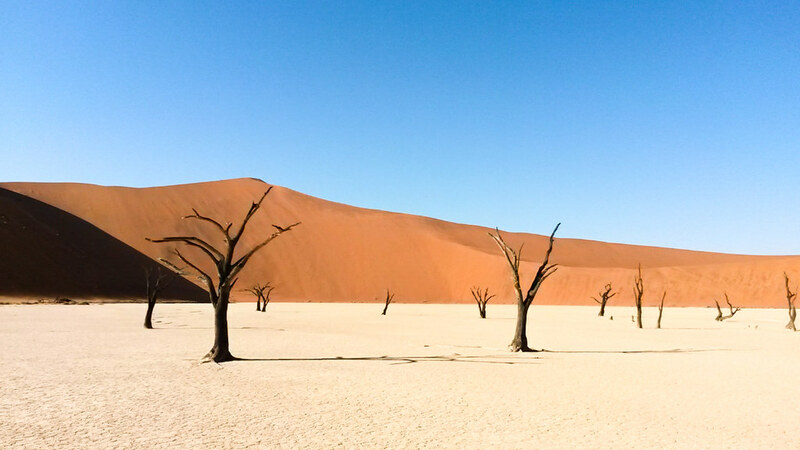 Love the dead tree place, your photo is so surreal. Thanks Chriss, I was actually worried about falling on my face too, but its actually pretty hard to trip. Think of it like moon walking. Seriously, no motos on the 60 km of tarmac road to the dunes! I was bummed and didn’t even make it out. good on ya for getting out there anyway..
Hi Gary, It is so annoying! Then its day light robbery for the taxi charge! But I am glad we managed to find a ride and enjoy this amazing place.